Yet again, a Pepper Basham novel has seen me up way too late at night, unable to close the book (or laptop). This novel had everything--sugar, spice and heart, through and through. It instantly drew me in and the characters practically jump off the page and I got invested within a heartbeat. There is heart, and oh, the humor in both the romance and the story on the whole. The moment I fell haplessly in love with Reese Mitchell, hook line and sinker, was on page 60 just after he finished chopping firewood--I mean, ladies, c'mon. Just something about a man doing manual labor like that. Reese brings firewood in for Dee, Dr. Adelina Roseland, and, as she is a city gal, offers to build her a fire since that night was going to be a cold one. But, the adorkable guy sticks his foot in his mouth and asks her this instead: "Want me to light your fire tonight?" When Reese replayed the question in his mind, he was pretty sure he'd already started a fire--on his face. "I mean, do you want me to heat things up in here for you." Her eyes grew wider. His face got hotter. "Let me fix you up a fire." He pointed to the fireplace to rule out any doubt. "Right here. In the fireplace." Dee and Reese are both somewhat gun-shy and despite the surface-level differences, have a good bit in common. They bring out the best in each other, challenge each other to be better and embrace amazing grace--together. 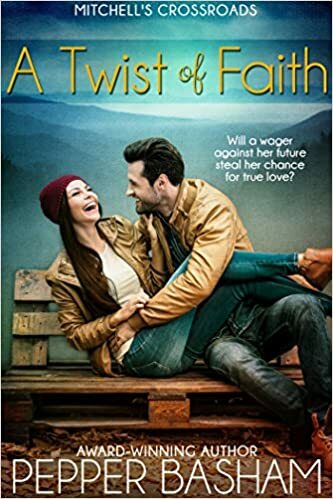 For Reese, it's letting God handle his past, and in addition to that for Dee, through out the novel she comes to let God have the future and birth a new dream in her heart, challenging all her preconceived notions. With a message woven tightly through from page one to the happy ending betwixt and between grinning dogs, adorable children, colorful relatives and swoon-worthy romance--this novel is a must read. Pepper Basham is an award-winning author who writes romance peppered with grace and humor. She currently resides in the lovely mountains of Asheville, NC where she is the mom of 5 great kids, speech-pathologist to about fifty more, lover of chocolate, jazz, and Jesus, and proud AlleyCat over at a group writing blog, The Writer’s Alley. Her debut historical romance novel, The Thorn Bearer, released in May 2015, and has already garnered its first award with Readers’ Favorites International Awards. Pepper’s second and third books in the series arrive in February 2016. Her first contemporary romance debuts in April. You can connect with Pepper on her website at www.pepperdbasham.com, Facebook or Twitter. Oh Meghan!!! It's WONDERFUL!!! And the pic of Chris Evans....yep, I'm totally cool with that! I totally appreciate that view of Chris Evans myself! Can't wait to read Pepper's book!